This backyard shed puts an end to the stigma that sheds are dull looking wooden boxes. The featured 6” deep roof overhangs establish a stunning profile while providing protection from the elements. 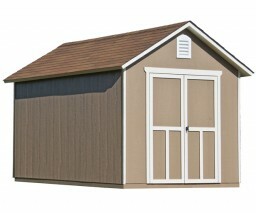 To make coming and going easy, this 8x12 shed is outfitted with 56” wide double doors – perfectly sized for lawn tractors, lawnmowers and wheelbarrows. The spacious interior is complimented by 6’4” tall side walls so you have plenty of height for shovels, rakes and weed trimmers. All of these premium features rest on a strong 2x4 wood frame. While our backyard sheds are well equipped for typical outdoor storage needs, our wide variety of functional and decorative accessories give you the power to utilize our sheds as a workshop, studio, hobby room or personal sanctuary. Adding a shelf, window and workbench is a great start to making your backyard storage solution multi-functional on the inside and out. Your local building authority may have specific requirements resulting in additional cost. Prices do not include painting, staining, permits, zoning and setback advice and/or compliance, excavation, or leveling beyond 6". All prices and content are subject to change without notice. Promotions are valid with online transactions only and cannot be used in conjunction with promotions at a servicing sales/distribution center or distribution center. Not valid on prior purchases. All stated sizes are nominal dimensions and approximate. Some buildings may be shown with optional items. Additional mileage charges (if applicable) and taxes will be calculated after checkout process is completed. Painted backyard storage shed is a representation only, arrives primed for painting in a light beige color. 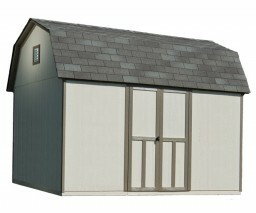 I am totally satisfied with my new Shed and amazed at the Quality for the low cost and how quickly it was done ! I would use them again and i do refer them as well ! !